What a great day of celebration yesterday was! Jack Smyth, having been invested with the Victoria Cross by His Majesty, travelled straight to Oxford and his old school. 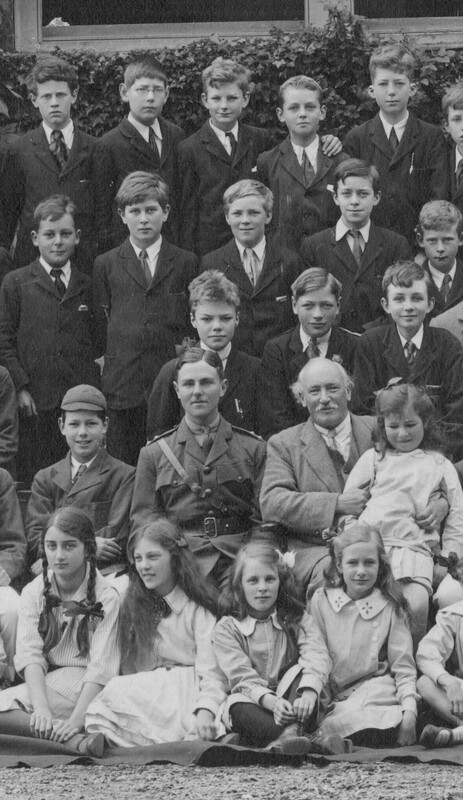 “At nine o’clock on Tuesday 13th July, the school photograph was taken, and Jack Smyth was photographed with us. When the business was over we went into the Hall and sang a hymn. It was then the embarrassing duty of one of the boys to make a short (extremely short) speech, and he felt much more comfortable after it was finished. Jack Smyth was then requested to tell us exactly how he won the VC. He climbed on to the platform to the accompaniment of thunderous cheers, and drew a map and explained all about it. In conclusion he said, “Needless to say, this is the first and last time I am ever going to say anything about this, and I would not have done so today unless I had been bullied into it by G.C.” * At this we nearly took the roof off with shouting. 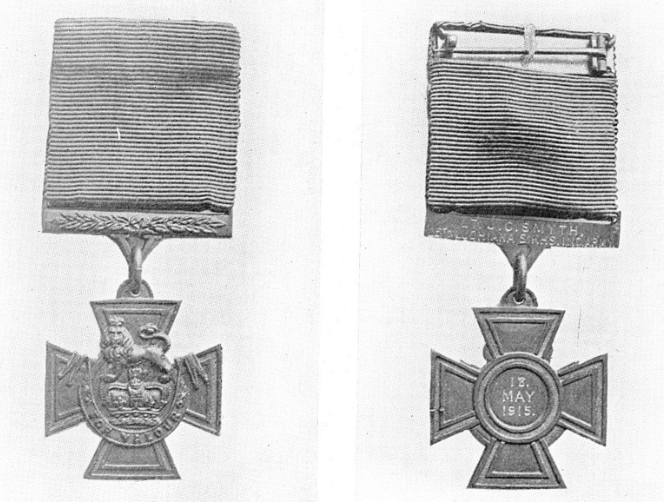 Jack Smyth got down from his perch, and standing between the parallel bars produced his Victoria Cross, while the whole school filed by, one by one, to examine it. He wound up by asking the Skipper for a whole holiday. After more cheering, Jack Smyth stepped boldly from the school buildings to face an enormous body of photographers. This latter ordeal ended the morning’s proceedings. In the afternoon we played a most exciting cricket match against Jack Smyth’s team. We hear that George Fletcher (Royal Welsh Fusiliers) is making a name for himself on both sides of the front line. Apparently he taunts the Germans with any news that comes his way of Allied successes, which he chalks up on a board. The Saxons opposite then take pot shots at it, which the Tommy likes to score as if he was on the ranges at Bisley! George was trying to persuade the Germans to join in a beer, sausage and plum pudding evening on Christmas Day but his C.O was not impressed. Nonetheless, the Germans did provide two barrels of beer and there was general fraternization and exchanging of food and cigarettes. 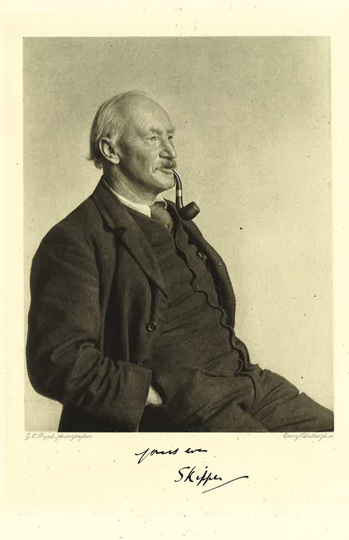 Greville Drew (Capt. R.E.) was able to enjoy a more relaxed time well behind the front line. Xmas Day. “We are very glad to be out for Xmas and a few days’ rest. We are in an extremely comfortable billet with a dining room, sitting room, kitchen, and two bedrooms for the four of us that there are now – three officers and an interpreter – or interrupter as the Indians all insist on calling them. We have decided to have a real day off today and are leaving the men to their own devices for the first time since we have been in the country. Tomorrow we shall start getting them really straightened out. All the same, we are not to be caught napping today. We have orders to stand by in case the enemy should consider Xmas Day a suitable opportunity for a little devilry, so we are all ready to move at a moment’s notice. The King’s Xmas cards to all ranks have just arrived. Alan Leggett, one of the three Old Dragons killed on October 31st and whose death was posted on these pages on November 2nd, was interred with full military honours at St. Martin’s, Cheriton in Kent on Wednesday afternoon. On Monday his body had been brought from Boulogne by his father. The coffin, which was borne from the house to the church on a gun carriage drawn by men of the Northamptonshire Regiment, was draped with the Union Jack. A firing party composed of men of the Northamptonshire Regt. marched in front of the gun carriage. We are grateful to Col. and Mrs Leggett for sharing with us the contents a postcard Alan wrote to them only a day before he died. Greville Drew (Capt. 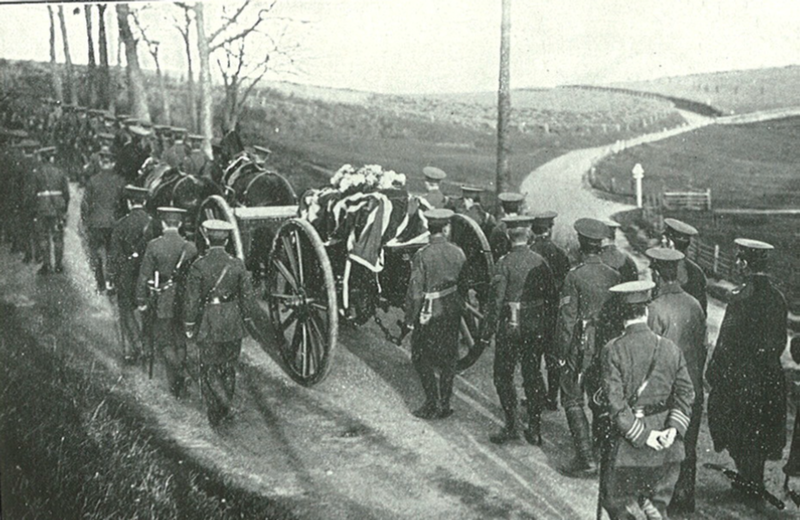 Royal Engineers) reports better conditions at the front, but hostilities continue, even if there is no major battle. 4/12/14. “All the troops are either in the trenches or comfortably in billets in farm houses, barns etc and they really have to endure very little hardship, as far as the cold is concerned. It is true that some of them got caught during that very cold snap, when it suddenly froze after raining, and I know one regiment had 120 cases of frost-bitten feet. What is going to be the trouble is the wet and not the cold. I have just done six days on end in the trenches, up night and day, and I can assure you there is not much suffering from cold there. Every man digs out his own little shelter in the firing-line, and roofs it over with material and stuff out of the houses on the road behind. There is a huge brazier burning every few yards and the trenches at night are very nice and comfortable – when it isn’t raining. With my section during my week in the trenches I was lucky enough to have hardly any rain at all, and in any case it would not have affected me much, as my dug-put was quite weather-proof, roofed in with an old ammunition box full of charcoal, burning all the time. I did all my cooking on that. That is another thing. All our troops are fed absolutely tip-top. We get bacon, fresh or tinned meat, jam, cheese, tea, sugar, every day, with butter and tobacco and matches occasionally. Of course, we buy our own butter, of which there is any amount about. In fact, one of the things that strikes one is how the civil population is staying right up near the firing-line. It seems foolish in a way, as the number of spies and snipers is prodigious. During an attack on a German sap-head we lost one officer killed, one wounded, and six men killed and wounded, but we accounted for over forty Germans, who were stuck through with bayonets whilst fast asleep in their covey-holes!